Plantar fasciitis is a painful condition that affects 2 million people per year. It’s so common that it is given clever names like “policeman’s heel” and “jogger’s heel”. But these names belittle the impact this condition can have on someone’s life. The key is to find good footwear that supports your foot. This will help avoid aggravating your plantar fasciitis. There are many kinds of footwear that can get the job done, so it’s best to look for shoes that fit your lifestyle and job requirements. 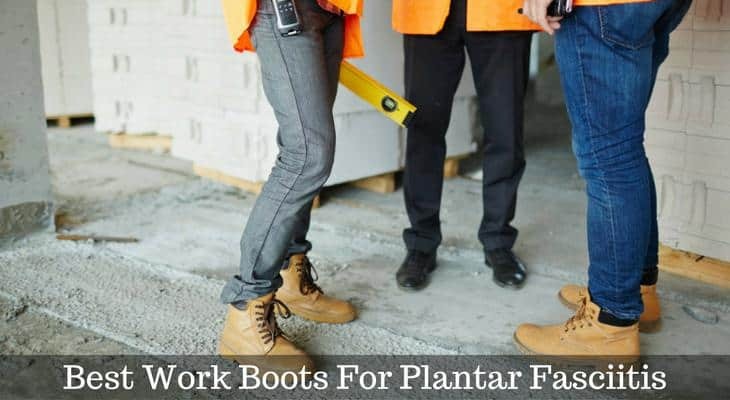 Below are some examples of the best work boots for plantar fasciitis. This work boot is great for rugged jobs that need a steel toe for protection. It’s crafted from quality leather which contributes to its durability. The waterproof materials allow air in to help keep your foot dry, and the wrap-around rubber outsole is oil- and slip-resistant. It meets safety standards and requires no breaking in – you can put this boot on right out of the box and work a full day. One thing that really makes this work boot stand out, and makes it a great choice for those with plantar fasciitis, is its sole. Keen has a reputation for comfortable, supportive shoes and this work boot is no different. 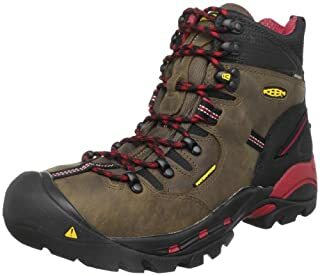 Keen’s signature insole is used in this boot which supports your foot and provides cushioning when you’re on your feet all day. The key to this insole is that it conforms to the ball of your foot, where your plantar fascia connects. By supporting this area, it reduces stress on the plantar fascia and alleviates pain. This specialized insole makes this product one of the best steel toed boots out there. If your job doesn’t require a steel toe, the Timberland PRO Hyperion Work Boot is one of the best waterproof work boots on the market. It’s made of leather which is a must for those doing any labor-intensive jobs or projects. The waterproof material keeps your feet dry and its lining keeps them stink-free. The Vibram outsole gives you traction and stability even on oily, slippery surfaces. A unique feature about this work boot is its Anti Fatigue Technology footbed. This footbed uses Timberland’s specialty foam which absorbs shock and reduces stress on your plantar fascia. This, along with its conforming arch support, ensures the best answer for your aching feet. And finally, you can feel good knowing Timberland uses recycled materials in its products and packaging. So, your feet can be pain free while you work and your mind can be at ease knowing you’re supporting a company with its values in the right place. 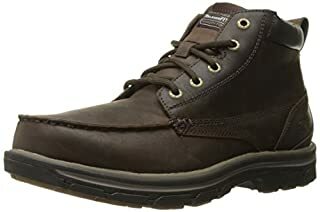 If you’re looking for a work boot that will transition you from working outdoors to working indoors then look no further. The Skecher’s Segment-Barillo Boot is rugged enough to withstand rough terrain and gives support up to the ankle, but stylish enough to wear inside to meet with a client. Although these boots are not waterproof, they are made of leather which speaks to their long-term usability. The design of this boot makes it extremely versatile. The chukka boot is a sought-after style these days. You won’t feel out of place working on the shipment floor or meeting with a customer about their next order. The insole in this boot is what really makes it stand out. The gel memory foam adds just enough cushion and give to make you forgot you’re wearing work boots at all. And if you need waterproofing you can always add a waterproof spray to the leather. The main draw to this boot is its comfort which makes it one of the best work boots for concrete floors. 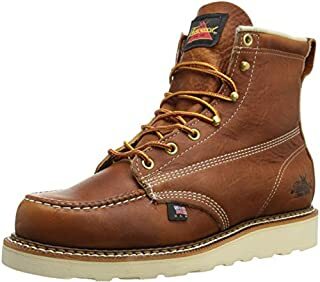 For a boot that’s both stylish and waterproof, the Irish Setter Men’s Work Boot gets it done. It is made of sturdy leather and is flame retardant. It meets electrical safety hazards and has a thick sole with lots of traction. The lace up system goes up to the ankle for added support and the EVA midsole helps to cushion your foot on uneven, hard surfaces. The footbed on this boot is made from polyurethane foam. Polyurethane foam not only cushions your foot but provides shock absorption as well. This prevents the impact of your foot strike from being absorbed completely by your plantar fascia. The result? Less pain! Again, this boot is a stand out due to its stylish design. If you have a job that requires waterproof protection and want to look good doing it, this boot accomplishes both. 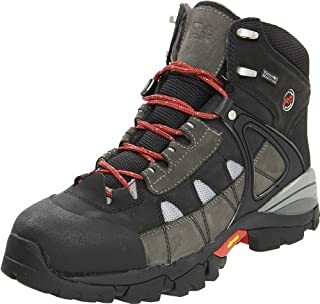 In addition to its outstanding sole, it is one of the most comfortable work boots out there that also has the ability to turn heads. 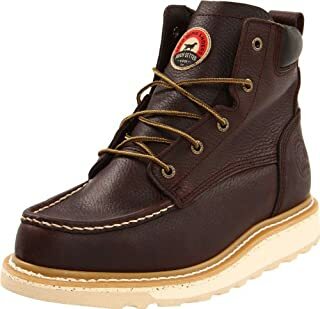 The Thorogood American Heritage Work Boot is considered one of the best boots for plantar fasciitis. This ankle lace up boot is a great mix of old school looks with new school technology. This boot is best for jobs that don’t require high safety standards as they do not have a steel toe. They are also not waterproof. The Vibram outsole gives you unbeatable traction and stability. Its fiberglass shank offers the support you need along with the durability of leather. Its dual density insole provides that shock absorption crucial to relieving stress off the plantar fascia. The wide toe box allows your forefoot to spread out and makes space for a thicker sock. If you don’t like a lot of room in the toe box, order a ½ size smaller. This boot is also American-made, a standard that’s hard to find these days. It ensures you’re getting a shoe made of quality materials and craftsmanship. For a classic boot with a reputation for quality and durability, Thorogood always hits the mark. With so many shoes to choose from, it’s important to know how to choose footwear that not only meets your work requirements but also decreases pain from your plantar fasciitis. 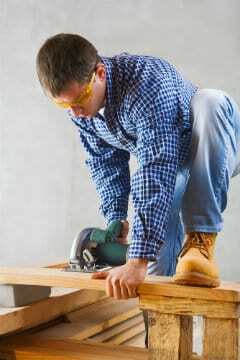 The list of plantar fasciitis work boots above should give you a good place to start. Just because you need shoes that hold up under rugged conditions doesn’t mean you should settle for an insole that doesn’t give you the support and comfort that you need.